As the track leaves Austria, it also draws away from the influence of the westerly winds which have controlled the meteorology up to this point. In summer, the Danubian plains over southern Hungary are affected more by the Mediterranean climate advancing northward from the Adriatic Sea than from the march of Atlantic disturbances. The pronounced effect on cloud cover and the amount of sunshine leaves little doubt that the best European eclipse conditions will be found in Hungary, Romania and Bulgaria. For the most part, the path follows the lowlands along the Danube River and is protected from stronger weather systems by the Carpathian Mountains in the north and the Balkan Mountains in the south. Prevailing winds blow lightly from the north or northwest, being drawn into a large low pressure system which forms over Iran in the summer. These etesian winds bring dry invigorating air which is constant in direction and speed. Precipitation is mostly in the form of showers and thundershowers, and tends to be greatest where the winds blow upslope Ð generally on the northern slopes of the Balkan Mountains. Figure 22 shows that the eclipse track begins to cross the cloud isopleths at a sharper angle eastward from Hungary, with the result that the mean August cloud amount has dropped to about 45% at the shores of the Black Sea. The amount of sunshine climbs above ten hours per day, more than 70% of the maximum possible. The number of days with scattered cloud or less at eclipse time rises from about half the month near the Austrian border to nearly two-thirds over Bulgaria. The probability of seeing the eclipse reaches 63% at the Black Sea ports of Varna and Constanta, popular summer destinations with beaches and fine Roman ruins to attract visitors and eclipse-seekers. Thunderstorms have a relatively high frequency of occurrence in eastern Europe and bring considerable cloudiness when present. But this convective cloud relies on the heating of the ground for much of its development, unless pushed by cold fronts or other weather disturbances. Because of this, cloud cover statistics tend to underestimate the chances of seeing an eclipse which takes place in the morning hours or in the early afternoon. The maximum time of thunderstorm development occurs at 6 PM local time, well after the noon hour date for the eclipse. Indeed, the cooling associated with the eclipse may delay the onset of convection for another hour or two. The path crosses Hungary's Lake Balaton, a popular resort area of warm water and sandy beaches. At one time the border between the Ottoman and Hapsburg empires ran down the center of the lake, and a number of ruined castles dot the northern hills above the lake. The location is easily reached from Budapest. According to Dr. Szécsényi-Nagy of Lorand Eotvos University, the weather in Hungary is normally stable in summer with occasional long periods (3-4 weeks) of high pressure, cloudless skies and a dry atmosphere. Dr. Szécsényi-Nagy studied 20 years of weather records for the week on either side of the eclipse date and noted that only three days of the 300 were without sunshine at stations along the track. According to his results, sunshine is the overwhelming character of the day, with nearly two thirds of the records showing more than ten hours each day. His conclusions are mirrored by the statistics for Keszthely ("cast-eye"), a resort and service town on the western shore of Lake Balaton. The 14 days of the month in which scattered cloud is reported at eclipse time at this location is the best in Hungary and comparable with sites in Romania and Bulgaria. Lake Balaton seems to have more than its share of sunny weather, likely a result of the protection afforded by the surrounding heights. 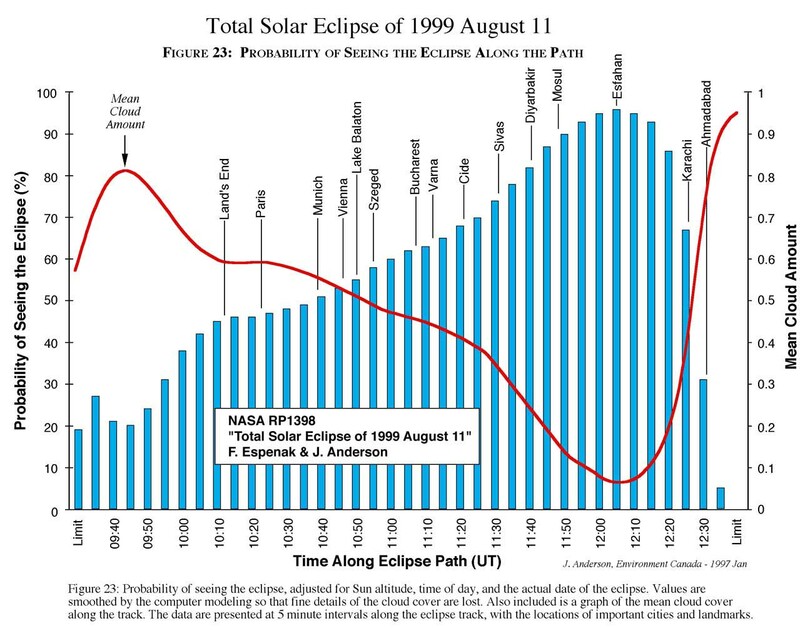 The eclipse viewing probabilities in Figure 23 do not show this advantage, but this is probably caused by the smoothing of the climatological record of cloud cover by the computer model. The real differences are best seen in the actual record of observations. Just after its point of maximum eclipse, the Moon's shadow crosses Bucharest, the capital of Romania. This city of two million promises to be a prime eclipse-viewing site, in part because of the comfort and ease of access, and partly because of the excellent weather prospects and the long eclipse duration. Since the center line neatly bisects the city, eclipse-viewing can be done from the wide boulevards or one of the many city parks. The sum of all of the climatological measures points to Hungary, Bulgaria and Romania as the choicest locations in Europe for viewing this event. The shores of the Black Sea offer the greatest prospects of success, with a generous sunny climate enhanced by sea breeze circulations. Other suitable spots can be found all along the track from Lake Balaton eastward. To get any better weather prospects, the eclipse location will have to move to the other side of the Black Sea.